Feel free to multiply this recipe up for a buffet. Any leftover brandy snaps can be stored in an airtight container and filled with cream, or better, with ice cream. Preheat the oven to 150C/300F/Gas 2. Grease two baking trays with butter. For the brandy snaps, melt the butter with the sugar and golden syrup in a saucepan. As soon as it starts to bubble, add the flour, ginger, brandy and pistachios and stir until well combined. Using a teaspoon, place six walnut-sized blobs of the mixture onto the buttered baking tray. No need to flatten, as they will spread naturally. Bake for 10-12 minutes until golden-brown. Leave to cool on the baking tray for five minutes, and then lift them off with a palette knife. Lay them on a rolling pin to set. For the fruit salad, combine the orange, lime and lemon juice in a large bowl. 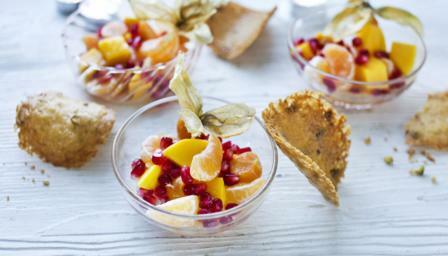 Add the mango and the clementines, scatter over the pomegranate seeds and serve with the brandy snaps and a few physalis.